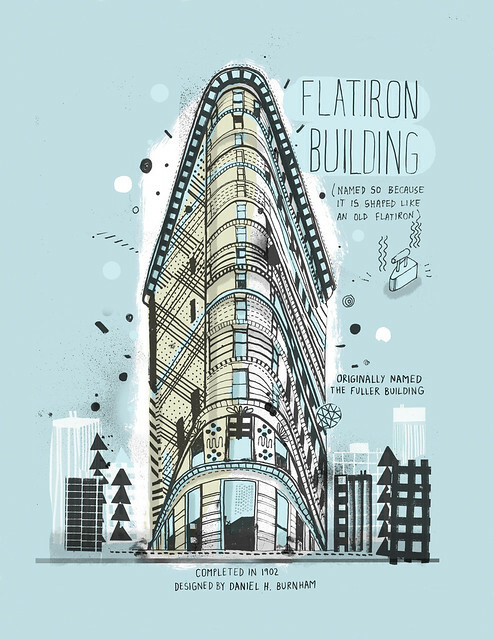 Our launch party to celebrate the new book ‘All the Buildings in New York’ is just days away on Thursday 5/23! 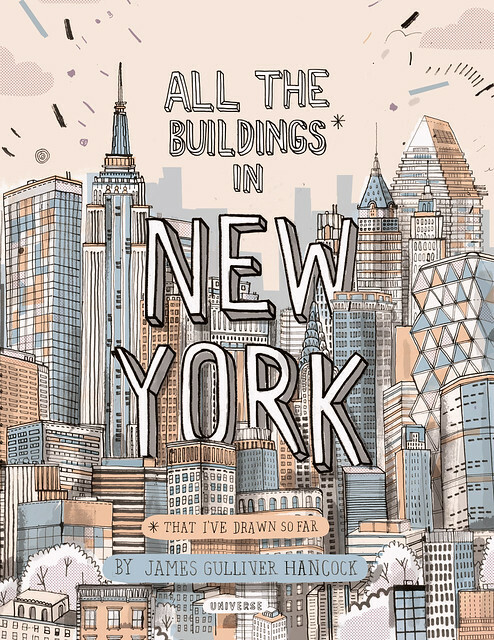 By artist and illustrator James Gulliver Hancock, the book is an artist ode to New York City as rendered in his signature colorful and whimsical style. 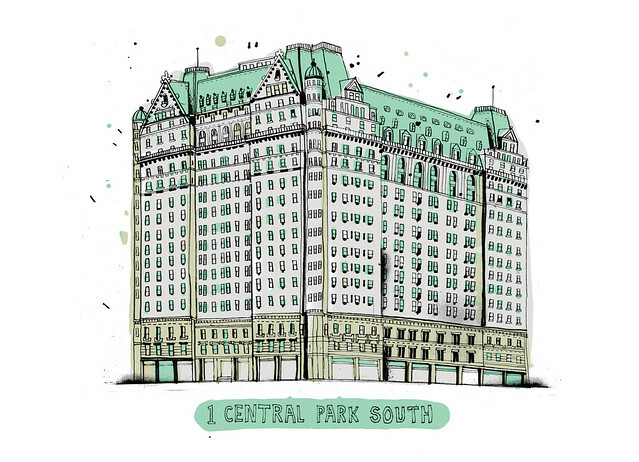 We spoke to James to find out more about his prolific and mammoth project to draw all the buildings in the Big Apple, his love for the city and notions of home. 1. 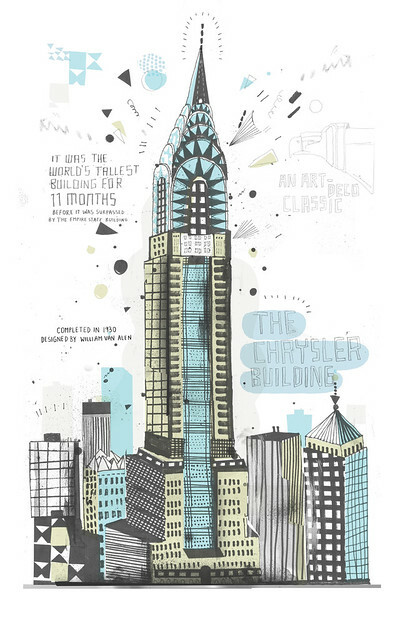 What is the premise behind ‘All the Buildings in New York’? I’ve been doing these obsessive collections of different cities as I’ve travelled. I’ve done prints for ‘All the Cars in Los Angeles’, ‘All the Rain in London’, ‘All the Bicycles in Berlin’. But when I moved to New York, this project became more intense, as I used the building drawings to get to know the city. By drawing my new surroundings I made myself a kind of map of the places I liked. I love this idea of really getting to know something by drawing all of one thing, of focusing, but at the same time having a massive, almost unrealisable focus. 2. 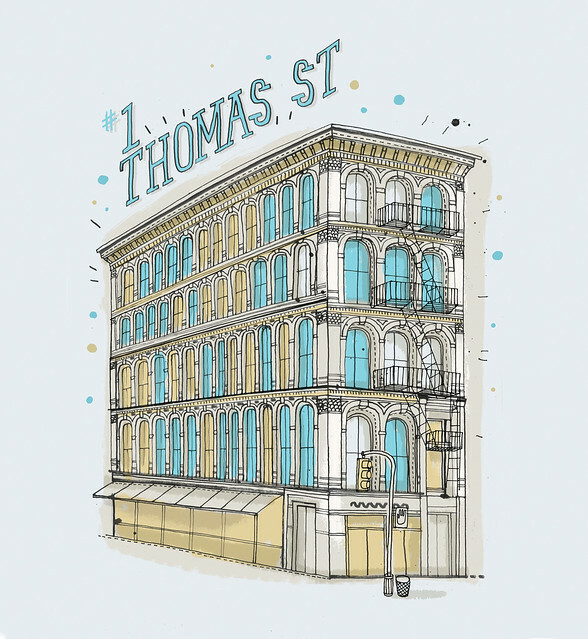 What do you look out for in a building before deciding to draw it? I started by drawing all the interesting buildings I saw in my close proximity, all the great brownstones I’d seen in movies, television etc. Now the project has taken on a different turn, where a lot of people order commissions of certain buildings. So this takes me to very different parts of the city, and as an outsider it’s been a great way to see parts that the tourists don’t see, and also really get a feel for how people live in New York, the reality of which I was pretty unfamiliar with having grown up in Australia. 3. What originally brought you to New York, and how long did you live there for? My wife and I lived in Los Angeles and thought we would like to move to Europe, but for both our careers thought the USA was better for us. It’s such an inspiring, encouraging place! So we compromised and moved to New York, maybe the most European city in the US. 4. 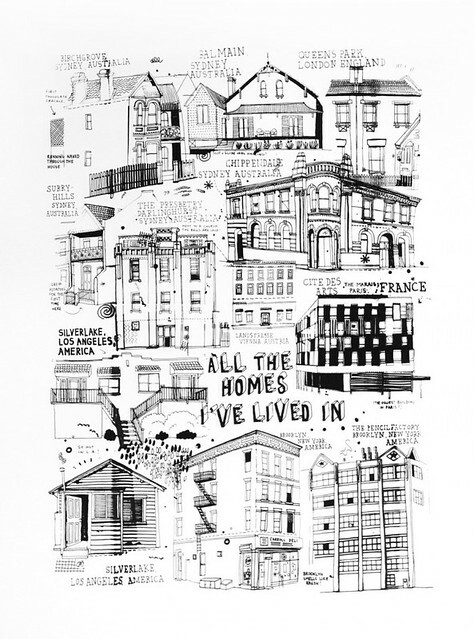 What was your home in Brooklyn like and do you have a drawing of it? 5. What is New York City like, as seen through your eyes? What do you like/dislike about it? I love that it is so dense, that you can pretty much walk down any street and there will be something interesting, there will usually always be people on the street and interactions with strangers are commonplace. I love that. Being from such a naturally beautiful place as Australia though it’s hard to come to terms with the grittiness. I miss the beach and walking around bare-foot, and fruit trees on the street like there are in Sydney. 6. Are you partial to a certain neighborhood in New York and why? I love Brooklyn, my friends are there, people are just trying things all the time, so many little start up shops and businesses, so many studios of people making stuff happen. You can feel this walking around. It’s like a very professional DIY. 7. Having lived in a few different places, do you experience culture shock when you’re settling into a new city? Are there any instances that come to mind? I think culture shock was way more in my face when I was travelling much faster. I travel mostly for work now, so it’s usually for a reason and is all set up. When I was younger I would just show up in a city and figure it out, that became quite a thrill, working out the culture, where to stay, what to eat. It’s such an intense jump in the deep end. 8. What is the next thing that you plan to draw everything of? I do this project in a number of cities, I’m sure something will grab me the next time I’m in a new place. That’s really the fun of travelling and getting into new places and finding what sticks out for me. 9. You will be offering a raffle to draw people’s childhood home at the event. Why the childhood home? I think there will always be something special about our childhood homes. It’s maybe where we learnt to walk, where we first felt the earth beneath our feet, and it is usually filled with cloudy 1/2 formed memories of times passed. It’s nostalgia that makes architecture really stand out. 10. What can people expect at the book signing? It’s going to be fun! 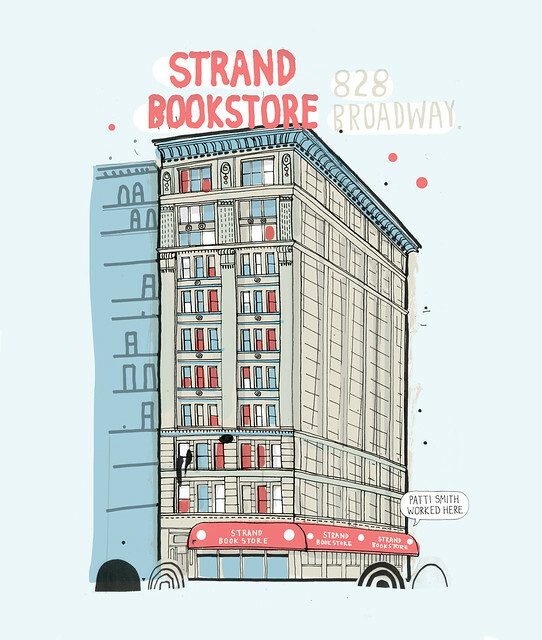 we’ve got a few giveaways, Sqirl is going to drop something awesome to nibble on, we’ll have plenty of books on hand as well as a little installation of some of my prints and original drawings from the all the buildings series. A good change to get a behind the scenes on me and my work. Find out more details about the event and RSVP here.